Despite being a known risk factor for colon cancer, a new study published in BMC Cancer has found obesity to be paradoxically associated with better survival in a cohort of 217 advanced stage colorectal cancer patients. Here to talk about the study and the potential reasons behind this paradox is lead author, Dr. Caroline Vandeputte. BMI (body mass index) is used to determine whether a person is a healthy body weight. But it has flaws. As long as I remember, people told me to always exercise and eat well to stay fit and healthy. Despite recent efforts in both the public and private sector to promote the consumption of healthier foods and motivate people to be more physically active, obesity remains a major concern worldwide. There are currently about 2 billion people overweight, of which 650 million are obese, indicating that obesity has nearly tripled since 1975 (WHO, 2016). Being overweight or obese is highly discouraged, as it is a major risk factor of high blood pressure, diabetes, stroke and heart failure amongst many other pathologies. Obesity would also have an immediate impact on your mental health and amount to a reduced quality of life. While we know that obesity is also a risk factor for the development of colorectal cancer, at the GUTS laboratory we wanted to investigate the impact of obesity and body composition on survival after cancer diagnosis. How do you measure obesity and body composition? People are generally considered obese when they have a body mass index (BMI) of more than 30. 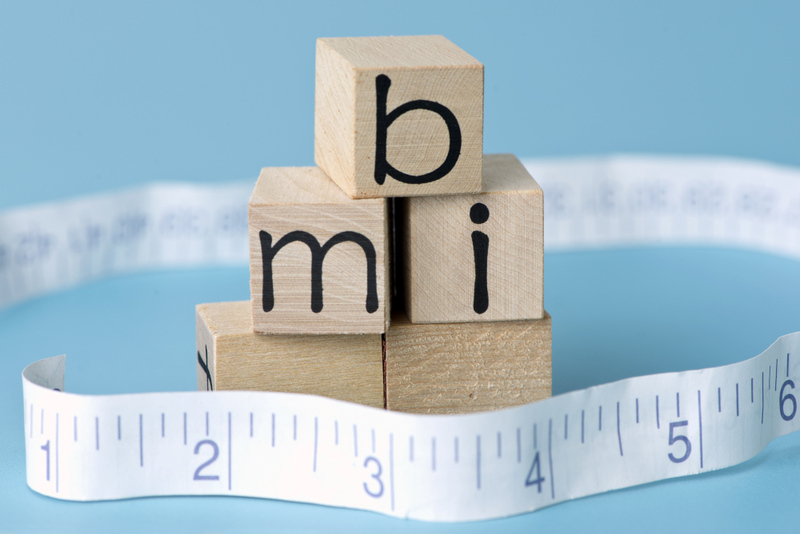 You can calculate your own BMI by dividing your weight in kg by the square of your height in meters (kg/m2). A healthy BMI should be between 20-24.9 kg/m2. People with a BMI between 25 and 30 kg/m2 are overweight. The major problem with BMI scales is that they do not distinguish between fat and muscle mass and do not accurately reflect the lipid content and inflammation occurring in the fat tissue. People with a high muscle mass and low fat mass, a condition often linked to a healthy lifestyle, may therefore have the same BMI as people with almost no muscle but with a high amount of fat tissue. Patients with a similar BMI but a completely different body composition. (A) Patient with sarcopenia or low muscle mass. This patient also has a high amount of body fat. (B) Patient with a high body mass and normal fat mass. Luckily, some other techniques are currently available that give a much better estimation of your body composition including computed tomography (CT)-scans. CT-scans can not only provide you with information on the amount of whole-body fat and muscle mass, but they can also give you some qualitative information on your body tissues. To study the influence of BMI and body composition on survival in cancer patients, we performed detailed body composition analyses on CT scans of 217 patients with advanced colorectal cancer that do not respond to chemotherapy. Much to our surprise, we found that in this patient population, obese patients had a better survival than non-obese patients. Obesity is a known risk factor for colon cancer incidence, so why would it be beneficial in our study? We are also the first to show that not only the amount of fat tissue, but even more importantly, the quality or density of fat has an impact on your survival. One explanation could be a different role of obesity depending on the stage of the disease. Where the adverse metabolic and inflammatory status linked to obesity takes precedence in the acquisition of colorectal cancer and the early stages of the disease, a larger amount of energy stored in your fat tissue becomes increasingly important and beneficial in an advanced stage of the disease. This hypothesis is also supported by our more detailed body composition data showing that not only a high amount of muscle mass but also fat mass is beneficial in a late stage of the disease. We are also the first to show that not only the amount of fat tissue, but even more importantly, the quality or density of fat has an impact on your survival. Whether the prognostic impact of adipose tissue density in our study is mediated by malnutrition, the role of inflammation, and/or an altered function of the fat cells, is currently being investigated. Nevertheless, our study shows that beyond the analysis of specific tumor mutations, which is often the only element used for personalized treatment, we should also take into account the physical state and the patient’s body composition in patient’s treatment decision making. What is the most effective intervention for ensuring weight recording in pregnancy? Dr. Caroline Vandeputte is head of translational research of the GUTS laboratory at the Jules Bordet institute in Brussels. Her research group aims to enrich the possibilities of personalized patient care through a multidisciplinary integration of available data and a rapid identification of the treatment’s effect to avoid useless toxicities in case of partial or total inefficiency.